To keep your credit card open and in good standing, your credit card agreement requires you to make your monthly credit card payments on time. You must pay at least the minimum by the cutoff time on the due date, otherwise your payment will be considered late. Missing your credit card payment puts you at risk of becoming delinquent. Credit card delinquency can affect your credit score and impact your ability to get any new credit-based applications approved. What is Credit Card Delinquency? Credit card delinquency is a credit card status that indicates your payment is past due by 30 days or more. At that point in time, your late payment status is reported to the credit bureaus and is included in your credit report. A late payment is added to your account and your credit card issuer may begin calling, emailing, or sending letters to get you caught up on your account again. Once your payment is 60 days delinquent, your credit card issuer is allowed to raise your interest rate to the penalty rate. The penalty rate will remain in effect for six months. After you make six consecutive payments on time, the rate will go back to normal for your existing balance. Your credit card issuer is allowed to keep the rate effective for new purchases on your credit card. National credit card delinquency rates can indicate how households are handling their debt. Rising delinquency rates could mean that people don’t have enough money to pay their debts and could signal larger economic problems. In the first quarter of 2018, credit card delinquency rates at commercial banks other than the top 100 increased to 5.9 percent, reports Business Insider. The delinquency rate hasn’t been that high since before the Financial Crisis. By comparison, the 100 largest banks have a credit card delinquency rate of 2.48 percent, helped by these banks’ ability to attract consumers with higher credit scores with lucrative credit card offers. Serious credit card delinquency rates increased to 1.78 percent in the first quarter of 2018 vs. 1.69 percent in the first quarter of 2017, according to data from TransUnion. Accounts that are 90 or more days past due are considered seriously delinquent. Many credit card issuers also suspend your ability to make payments once your account is seriously delinquent. What Happens After Credit Card Delinquency? Credit card delinquency isn’t the end of the road. Consumers have a chance to catch up on credit card payments and bring their account back into good standing. It will cost more to get caught up again––you must pay the entire past due balance, plus the interest and late fees that have accumulated. If you can’t afford to pay the past due balance, contact your credit card issuer to find out your options for getting caught up again. 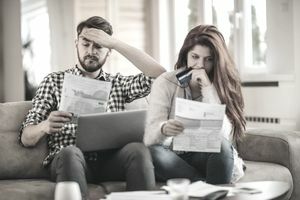 Consumer credit counseling may be another option for getting caught up on your payments, particularly if you are delinquent on multiple credit cards. Otherwise, if your credit card balance remains delinquent, it will eventually be closed and charged-off. That happens once your credit card payment is 180 days past due. Once a credit card balance is charged-off, you no longer have the opportunity to catch up again and bring your account current again. The entire balance is due and may be sent to a collection agency if you fail to pay it off with the original creditor. Can a Credit Card Delinquency Be Removed From Your Credit Report? Once negative information has been added to your credit report, it’s generally only removed if it is inaccurate, incomplete, cannot be verified, or past the credit reporting time limit. If your credit report includes an erroneously reported credit card delinquency, you can send a credit report dispute to have it investigated and removed. Send a copy of any evidence you have that can support your dispute. Otherwise, removing an accurately reported credit card delinquency is tougher. Credit card issuers are legally allowed to report negative information as long as it’s correct. Your credit card issuer may be willing to remove the delinquency if you catch up on your payments again. Even if you can’t remove a credit card delinquency, catching up on your payments is important to prevent your account from being charged-off and your credit from being damaged even more. The sooner you get caught up again, the sooner you can begin rebuilding your credit score with timely payments. Once you catch up, your account status will show that your payments are currently on time. After seven years, the negative details for the account will fall off your credit report.